EMDR is the most researched form of psychotherapy to date regarding post traumatic stress disorder, and its results have proven to be effective and long lasting. EMDR works by stimulating the left and right sides of the brain using bilateral stimulation. Either by following the practitioners fingers with side to side eye movements or using sound or tapping. 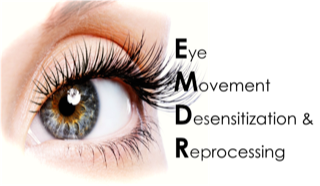 EMDR (Eye Movement Desensitisation and Reprocessing) is a powerful psychotherapeutic practice initially developed by Dr. Francine Shapiro in the late 1980’s to treat troubling symptoms of trauma and post traumatic stress disorder. It has been used worldwide since then to help clients come to terms with a wide variety of troubling conditions and problems. Human beings have the inborn capacity to process disturbing events and feelings. In most instances, the brain reprocesses painful information over time so that it is stored in our normal memory system. In optimal circumstances, the individual can access memories without being unduly stressed. However, there are instances in which the brain becomes overwhelmed and normal processes of problem resolution fail to achieve this desired end. Problems seem to become “frozen” in our minds, and the painful images, thoughts and feelings associated with the event seem to be “locked” in the nervous system, often out of conscious awareness. These memories then have a lasting negative effect on the individuals emotional and interpersonal functioning in the world. EMDR helps to unlock painful and negative memories, and helps the brain to more effectively reprocess old information so that it becomes less debilitating. If you would like a confidential chat to discuss how EMDR may be able to help you or to make an appointment please call Manor House reception on 01502 712505 or use our contact page.